Culture, History, Heritage and FUN in, around and beyond London. 12 students………One Girl or One Boy ONLY per country accepted. Students will be accepted provisionally on receipt of a scanned application form on a first come first served basis, allowing for gender balancing. Payment then secures the place and the students will be given details of the preferred method of payment once they have been accepted provisionally. In the case of accepted students withdrawing up to 30th April 2018, the fee will be refunded in full. After this date there will be no refund. We therefore recommend that the participants get special cancellation insurance. Participants are responsible for their return fare to London and should bring a reasonable amount of pocket money. All participants are responsible for insuring themselves according to the guidelines in Rotary International Code of Policies on Travel insurance for Students, which covers illness, accident, third party damages and personal effects. Details of the policy which RIBI requires will be sent to successful applicants with their Joining instructions in early May. European participants should bring their European Health Insurance Card. 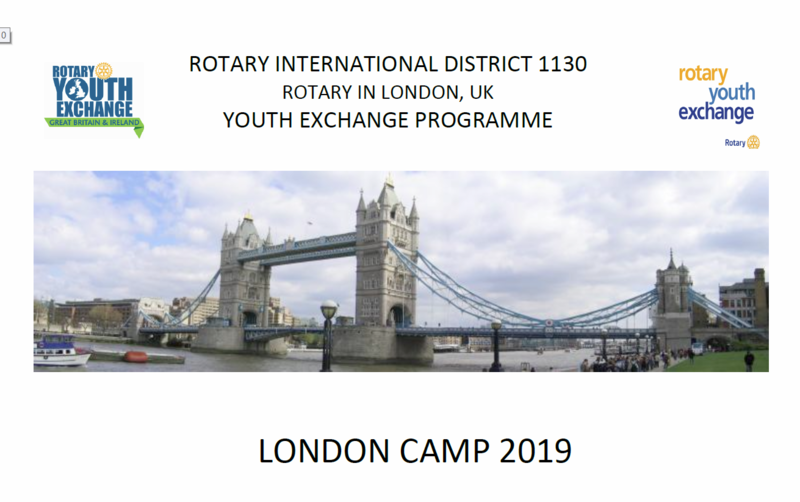 Rotary Club Representatives will ONLY be at London Heathrow or at St Pancras for Eurostar to provide assistance and transportation (arrival and departure). PLEASE DO NOT BOOK FLIGHTS TO LUTON, GATWICK OR STANSTEAD AIRPORTS. THEY ARE TOO FAR AWAY AND ARE UNSUITABLE FOR EXCHANGE STUDENTS TRAVELLING ALONE. STUDENTS WILL NOT BE MET AT THESE AIRPORTS. Further details, including itinerary, will be sent to successful applicants in due course.